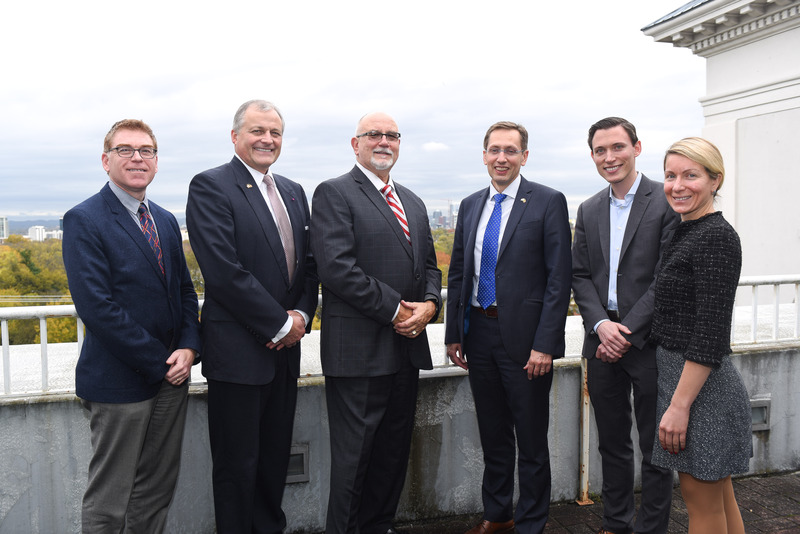 The Jack C. Massey College of Business hosted the Consulate General of the Kingdom of Belgium, Mr. William De Baets, and the President of the Belgian American Chamber of the South, Mr. Anton Mertens, earlier this month. The visit was coordinated by Dr. Christophe Van Linden, Belmont assistant professor of accounting and also a native of Antwerp, Belgium. Other participants included Dean J. Patrick Raines, Dr. Jeffrey Overby and Dr. Marieta Velikova. The group discussed Belgian-U.S. economic and political relations in addition to Belmont’s recent signed memorandum of understanding with the University of Antwerp. The Belgian visitors were on a trip to explore areas of opportunity and collaboration with Nashville and Middle Tennessee and had participated in a roundtable at the Nashville Area Chamber of Commerce earlier in the day.